Recently, I watched google i/o tech talks and I found that progressive web + physical web is quite interesting. I had an idea that i want to play with Bluetooth Low Energy devices. For prototying the idea, I bought a raspberry pi zero w. (yup. this is my second one). Before watching the techtalk, rpi0 meant nothing to me. Because I always wanted to have powerful small computers that I can make a cluster. Now, it makes sense to play with rpi0w. it's a good fit for me to play with it to prototype physical web related ideas. install virtualbox and ubuntu. prepare your disk that is larger than 16GB if it's a desktop version of ubuntu. burn your sdcard with following commands. the image has iptables, ssh, erlang, node.js, bluez, git, vi, etc. Because it's for prototyping a ble app and testing it. I referenced this slide and getting started doc from nerves-project. Now, let's configure our linux image. you can even find nginx, wireshark,etc in networking applications. Run make savedefconfig after make menuconfig to update the nerves_defconfig in your System. it will spit out results like this. we can add vim, grep, ifconfig, ping, ps, top, free, etc with following command. busybox-menuconfig only works when busybox is enabled. this is what getstarted doc says. If your system doesn’t contain a custom Linux configuration yet, you’ll need to update the Buildroot configuration to point to the new Linux defconfig in your system directory. The path is usually something like $( )/linux-x.y_defconfig. For Busybox, the convention is to copy build/busybox-x.y.z/.config to a file in the System repository. 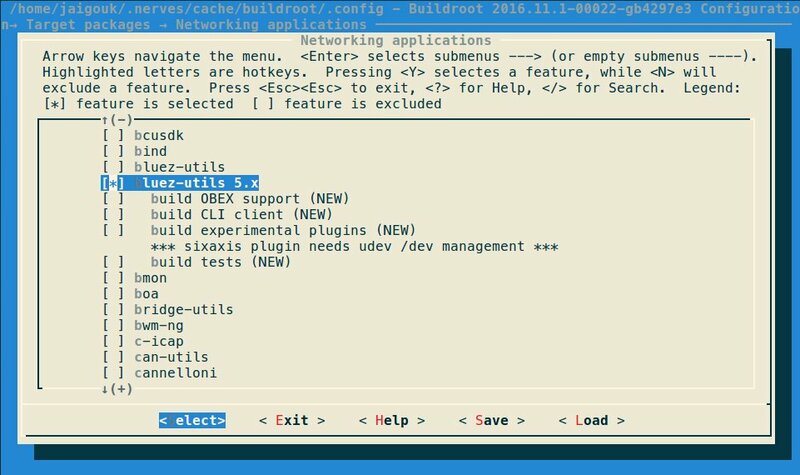 Like the Linux configuration, the Buildroot configuration will need to be updated to point to the custom config. now my custom rpi0 config is ready to be used.